Stewartsville, MO…..Velva June Hinderks, age 93, was born September 11, 1923 in Hamilton, MO to Robert and Sada (Willis) Hampton. She passed away February 9, 2017 at her home in Stewartsville, MO surrounded by her loving family. Velva worked as a secretary for twenty years for the Social Science department at Missouri Western State University retiring in 1990. 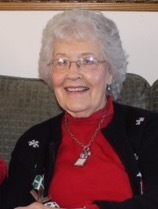 She was a member of Community of Christ, Stewartsville, MO. On September 1, 1946 she was united in marriage to Norman C. Hinderks in Stewartsville, MO. She was preceded in death by her husband, Norman on March 16, 2003; parents; three brothers, Robert, Paul, and Gene Hampton; sister, Leta Vreeland and infant sister, Betty Hampton. Survivors include: her children, Ron (Bonnie) Hinderks, Stewartsville, MO, Sandra (Bob) Beckett, Stella, Nebraska, Nancy (David) Martin, St. Joseph, MO; sisters, Lois (Chuck) Harris, Independence, MO, Bonnie Barron, Hamilton, MO, and Valliera (Marvin) Myers, Las Vegas, NV; grandchildren, Brandon (Katie) Beckett, Brooke Beckett (Jeff Campbell), Amy Teschner, Lori (Sam) White, Tracy (Ryan) Martin, Kevin (Kendra) Martin; fourteen great-grandchildren and numerous nieces and nephews. I’m sorry for your loss. God bless.